Home Engineering How CBSE Score May Help With Your JEE Main Ranking? How CBSE Score May Help With Your JEE Main Ranking?- JEE main score is the main factor of evaluation while evaluating your application for engineering colleges but your class 12th score (normalised) also plays a very important role in your JEE Main Ranking. A very good CBSE Score may help with your JEE Main Ranking. Here we will evaluate how your CBSE result may twist your composite score for JEE Main Ranking. It is found that JEE Main Ranking with CBSE Score will not only get you a good AIR but also you will be step closer to your dream college. As CBSE marks helps in JEE and helps to get admission in top engineering college but if you haven’t scored well in 12th class you might lose the edge over others. If you have appeared for JEE you must be aware that it is your All India Ranking which will help you to get the admissions to the prestigious institutes like NITs, IIITs and GFTIs. Here we will help you to know how you get those rankings. How JEE Main Rank List is prepared? JEE Main Rank List is prepared with combined scores of JEE Main and Normalized Marks of Class XII in the ratio of 60:40. The combined scores are arranged in distinction value and the rank is awarded on this basis only. How to calculate composite score? We know what is JEE Main score but how to calculate normalised score is the task. How to calculate Normalised score of Class XII marks? JEE has detailed a procedure for normalization of Board marks as given below. Note the aggregate marks (A0) obtained by each student in JEE Main. 5. Any subject other than the above four subjects. 3. Determine the JEE Main aggregate marks corresponding to percentile (P) at the All- India level. We call this B1. 4. 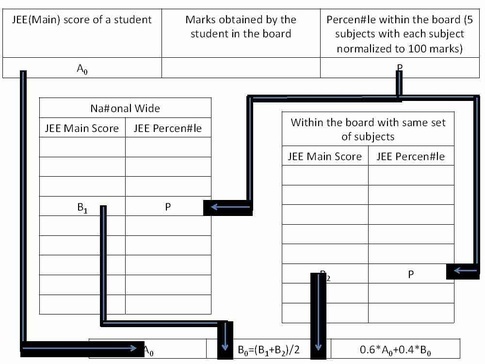 Also, determine the JEE Main aggregate marks corresponding to percentile (P) among the set of aggregate scores obtained in the JEE- Main by the students of that board. We call this B2. How the final JEE AIR is determined? By arranging the composite scores in distinction order, the All India JEE Main ranks are determined for JEE Main candidates. So we can say that CBSE Board Result helpful for JEE Main and you can rank higher if you have higher percentage in CBSE even though you and your friend have got same score in JEE Mains.